And that's Geneva for another year. It was a classic. The rumours about an Abarth-badged coupé turned out to be unfounded, which was no big surprise. What was a surprise was the complete lack of the 695 Tributo Maserati - the latest tribute car that Abarth told us would take its bow in Geneva. The usual display of tuned 500s and Puntos couldn't really make up for it. It is surely a sign for Alfa Romeo that the star of its Geneva presence was technically not one of its cars. The Disco Volante was built by Italian coachbuilders Carrozzeria Touring Superleggera and was designed to commemorate the 60th anniversary of the original 1952 Disco Volante. Little more than a re-skinned Alfa 8C, it is planned for a very limited production run. The biggest surprise from Aston Martin was not the European debut of the Zagato V12 or the upgrades to the V8 Vantage, but the unveiling of its new bespoke service. Brilliantly called 'Q by Aston Martin', the service allows buyers to customise their Astons in more ways than we can count. The A3 will undoubtedly be an important car for Audi but it is, to our eyes, a little... well, safe. The styling is an evolution of the current car's and while it does feature a clever interior it didn't make our hearts skip a beat. That task was left to the 450hp, 4.2-litre V8-powered RS 4 and the TT RS plus - the latter a run out model of the current TT, packing 360hp. We now understand why Bentley was so quiet before the show only releasing information on a sportier version of the Mulsanne. The undoubted star (for all the wrong reasons) was the EXP 9 F SUV concept. It was met with almost universal disdain for its questionable looks. 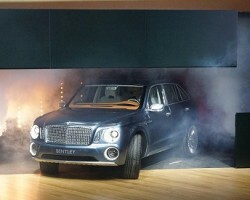 However, with the Porsche Cayenne doing so well in developing markets Bentley is keen to cash in and will, at some point, release its own SUV. Hopefully it comes after a restyle though. Named after the son of the company founder, the Bertone Nuccio concept is said to have been inspired by the Lancia Stratos Zero concept that the company presented at the 1970 Turin Motor Show. Built to commemorate 100 years of the famous Italian coachbuilder the Nuccio is powered by a mid-mounted V8 engine that produces 480hp. Tasty! BMW was one of the busiest manufacturers at the Geneva Motor Show. Alongside the new M Performance sub-brand's 376hp M550d (which we will not get) and X5/X6 M50d, the Bavarian manufacturer also unveiled the M6 in both Coupé and Convertible guises. Powered by the same twin-turbocharged V8 as the latest M5 the line-up could expand with an M version of the Mercedes-Benz CLS and Audi A7-rivalling 6 Series Gran Coupé that also took its public bow in Switzerland. That lot had to vie for attention with the M135i concept. Previewing both a three-door 1 Series hatch and a 300hp high-performance variant, the M135i is officially a concept, but could make it to production depending on the reception it receives in Geneva. Bugatti displayed not one but two examples of the Grand Sport Vitesse in Geneva. For those who have been living under a rock, the new car was created by combining the 1,200hp, 8.0-litre, quad-turbocharged, W16 engine from the record-holding Super Sport with the drop-top Grand Sport body. The end product is the most powerful and surely the fastest way to catch flies in your teeth. The big pre-show news was the unveiling of the Chevrolet Cruze Wagon - an estate version of Jason Plato's old car with a 130hp 1.7-litre VCDi diesel engine offering emissions of 119g/km - but this was overshadowed by the announcement that the Chevrolet Volt/Vauxhall Ampera was crowned European Car of the Year. Citroen finally let us in on a little secret in relation to the DS4 Racing - the astounding performance (260hp from a turbocharged 1.6-litre petrol engine) can be attributed to the team of engineers that prepare Sebastian Loeb's company car. Unfortunately it stuck resolutely with the concept tag but we still expect to see the DS4 R make it to production. Next to that few people seemed to notice the neat new C4 Aircross crossover. The Lodgy is an oddly named MPV from Renault's Romanian budget division. Scheduled to arrive in the UK early next year, the van-sized Lodgy will offer masses of room for not a lot of money with prices expected to start at around £17,000. With a 740hp V12 engine the F12 Berlinetta is the fastest, most powerful car that Ferrari has ever built. Computer generated images do not do the replacement for the 599 GTB any justice and it really does look better in the metal. Latest word from Ferrari is that no fewer than forty orders have already been taken for the new car. Did anyone notice the updated California on the same stand? A compact MPV/crossover based on the enduringly cool 500, the Fiat 500L will take over the Idea's mantle in the Fiat line-up when it goes on sale late in 2012. It's much larger than it looks in the pictures. The B-Max, a Fiesta-based MPV complete with B-pillar integrated into its sliding rear doors to give unobstructed access was all set to be the star of the Ford stand until the covers were pulled off a production ready version of the Fiesta ST. The 180hp offered by the 1.6-litre EcoBoost engine may not be as much as competitors like the Citroen DS3 Racing and Clio Renaultsport, but that did not appear to dampen enthusiasm for the fast Ford and we look forward to getting behind the wheel. A new Kuga and the Tourneo Custom concept (aka the next Transit) were also on display. The G-Power Bi-Tronik is the new BMW M5 for serious thrill seekers. The German tuners have managed to coax an extra 80hp from the 4.4-litre twin-turbo V8 meaning it produces 640hp. This gives the tuned M5 a 0-62mph time of 3.9 seconds and top speed the naughty side of 195mph. Having wowed the audiences in Detroit the European unveiling of the Honda NSX was overshadowed by more conventional supercars from Ferrari and Lamborghini. Doesn't stop us wanting to drive the modern interpretation of Honda's seminal car though. Elsewhere Honda finally moved into the 21st century with the new 1.6-litre i-DTEC diesel engine and refused to remove the prototype label from the CR-V that will most certainly go on sale in the autumn. t might look like the Veloster's big brother but the i-oniq concept is much more exciting than that. Showing the next evolution of Hyundai's 'fluidic design sculpture', the striking four-seat coupé is powered by a 107hp electric motor that gives the i-oniq a claimed range of 75 miles. However, like the Vauxhall Ampera and Fisker Karma, the i-oniq also features a range extending petrol engine (in this case a 1.0-litre three-cylinder unit) that can top up the lithium ion batteries and give a range of 450 miles with CO2 emissions of just 45g/km. Beside the futuristic i-oniq Hyundai also unveiled the new i30 wagon and the turbocharged version of the Veloster coupé, plus a facelifted i20 with a super-efficient new engine. Ignoring the fancy name, the XF Sportbrake is the estate version of the Jag XF. Sporting completely new sheet metal aft of the B-pillar, the Sportbrake will see Jaguar re-enter a market it has ignored since the X-Type estate was killed off. The most practical Jag will only be offered with four- or six-cylinder turbodiesel engines so no high-performance R versions - for the moment at least. Based on the underpinnings of the recently launched Hyundai i30 the new cee'd is claimed to be a completely new car from the ground up and not just a simple rehash. UK deliveries are expected in July and Kia promises a technically sophisticated, highly competitive C-segment entry. There is also some speculation pointing towards a possible compact crossover/SUV making an appearance. The estate version made a surprise appearance in Geneava. If only we were 12 years old again. Then it would not seem odd for a poster of the Lamborghini Aventador J to be adorning our wall. The one-off special is a roofless and windscreen-less version of the Aventador and did a very good job of disguising the fact that Lamborghini had little else to display on its stand. The J may have taken our car of the show award were it not for the fact that it is essentially a concept car that the Italians convinced someone to part with £2.1 million (excluding taxes) for. We drove the DC100 Defender concept just two days before it hit the show stand in Geneva, this time boasting some winter sports accessories. That debate will rage on, but the showpiece of Land Rover's stand in Switzerland was the even more controversial Range Rover Evoque Convertible concept. We fully expect this to be made, despite some negative feedback from the internet. It'll go down a storm in LA. After the furore of its Tokyo and Detroit unveilings the Lexus display was remarkably tame. The LF-FC, star of Detroit, showed up with a fresh paint job and the RX 450h received a facelift and an F-Sport model. Lotus's cryptic press release pointed towards a convertible Lotus and that is exactly what we got with the Exige S Roadster. F1 star Kimi Räikkönen was also on hand to add some weight to Lotus' plans to go racing in everything from karting to European GT. Mansory were one of a multitude of tuning companies displaying rather varied interpretations of the McLaren MP4-12C. The Mansory car was remarkably demure (bronze paint aside) in contrast to some of its previous monstrosities and boasted a power hike to 670hp and a liberal smattering of carbon fibre. We still question the claims of increased downforce however, especially considering McLaren's access to wind tunnels, F1 trained aerodynamicists and the like. As predicted the Kubang SUV made an appearance but seems no closer to production than when we saw it in Detroit. A refreshed GranTurismo Sport also featured alongside a special edition of the GranCabrio that was built in conjunction with Fendi - makers of fancy handbags. Combined the trio still could not paper over the fact that Maserati seemed ill prepared for Geneva and just rolled out what it found lying around the warehouse. Long before it made it to the shores of Lake Geneva Mazda announced that the Takeri concept would morph into the next generation Mazda6; yet little (if anything) about the concept changed from when it debuted in Tokyo last year. The big push was for the CX-5 SUV - the first car to benefit from Mazda's new SKYACTIV technologies. The all-new A-Class wowed audiences when it was unveiled at a special pre-show event and continues to do so as you read. The new premium hatchback gives Mercedes a genuine rival for the VW Golf, BMW 1 Series and equally new Audi A3. Some have dubbed it the 'real world' star of the show and we tend to agree. Rather less real world was the sensational new SL 63 AMG. The MINI Clubvan concept marks the next logical step in the Clubman's life with the rear seats removed to make for an oh-so-cute van for stylish city folks. It was joined by the 218hp John Cooper Works spec MINI Countryman that is the most powerful car MINI has produced. Still likely to make John Cooper spin in his grave though. The third generation Outlander crossover promises to be more efficient than ever, especially in 2.2-litre Clean Diesel guise. A plug-in hybrid model is set to follow in 2013. Everyone may have gathered round the BMW's 4.4-litre V8 engine powered Aero Coupe and Plus 8, but the big news from Morgan was the Plus E. The electric roadster looks like a Plus 8 but packs a 94hp Zytek developed motor that, unusually for an EV, will drive through a six-speed manual transmission. We RSVP'd Nissan's kind invitation and got to see the car that will replace the Note mini-MPV in the Japanese manufacturer's line-up. There were other concepts on hand too, but the only other new one was the Hi-Cross, thought to preview the next generation X-Trail. It seems Horacio Pagani has not quite finished with the Zonda just yet as five more versions of the track only Zonda R were confirmed. Pagani also confirmed that production for the long awaited Huayra supercar has finally begun and that so far 85 confirmed orders have been placed. Still no Huayra Roadster though. Star of the Peugeot show was undoubtedly the 208 GTi 'concept'. Wearing its heritage proudly on the C-pillar, much like its famous great grandfather, the 208 GTi, it is powered by the same 200hp 1.6-litre engine as the hot RCZ coupé. Apparently Peugeot also launched a new 4008 crossover. Named after the city that the Italian coachbuilder calls home, the Cambiano concept may well by the most exciting hybrid vehicle we have seen. The stunning show car is powered by electric motors at each wheel with a diesel powered turbine that can be called upon when extra grunt is required. When combined the Cambiano's hybrid system can output a total of 816hp making for a 0-62 time of 4.2 seconds and top speed of 155mph. Despite the performance the Cambiano has a theoretical range of 500 miles and emits only 45g/km of CO2. Now that's what you call a concept car. The all-new Boxster went with the motor industry's latest buzzword of downsizing with a lighter body and smaller more efficient engine than its predecessor. Despite this the new Boxster offers more power than before with 265hp in standard guise and 315hp for the Boxster S.
Renault surprised a lot of people (us included) by unveiling the Zoe electric supermini in Geneva rather than its home show in Paris. The Clio-sized EV will go on sale in the autumn with a price tag of £13,650 and will offer a range of 130 miles with the ability to recharge from a standard household socket via its 'Chameleon' charger. The French manufacturer also confirmed superstar DJ David Guetta and his wife Cathy as ambassadors for the Twizy quadricycle EV. Resident Swiss oddball, Rinspeed, wheeled out what it sees as the ideal solution for city car owners who crave more space. Essentially a Smart Fortwo with a trailer, the Dock + Go is actually fairly tame in comparison to some of the cars Rinspeed has brought to Geneva in the past. After nine years on the market Rolls-Royce thought it about time to refresh its flagship Phantom model. The Phantom Series II is not ground-breaking (that is not the Rolls-Royce way), but offers better economy, new technologies and a fresh look. A dark green version of the new 911 caught out attention on the Ruf stand, but then we realised that the yellow RGT8 next to it boasts a V8 engine. Ruf also revealed a Panamera with a longer wheelbase. The IBL Concept that was shown in Frankfurt morphed into the Toledo Concept for the trip to Switzerland. Ignore the concept tag though as the Toledo is near production ready and the five-door hatchback in a quasi-saloon body (think Skoda Octavia) will hit showrooms by year end. Alongside the Toledo SEAT also pulled the covers off the Mii - the Iberian version of the VW up! and a significantly facelifted Ibiza. We expected more than various versions of the Citigo on Skoda's stand, but nothing else materialised, which was a disappointment. Smart's tuning partner, Brabus, prepared an all-electric Fortwo that packs an 80hp powerplant, 17-inch wheels and 'electric green' colour scheme for Geneva. Smart's parent company, Daimler, says the Brabus electric drive will go on sale in 12 countries by year end. Brabus also wheeled out a 500-watt ebike that has a top speed of 25mph, presumably for when the electric Fortwo is on charge. The XIV-2 (eXciting User Interface Vehicle 2) is SsangYong's answer to the Range Rover Evoque. Built as the successor to the XIV-1 that was shown at the Frankfurt Motor Show, the production version should be powered by 1.6-litre petrol and diesel engines and it could be with us as early as 2014 if it gets the green light. The all-new fourth generation Impreza model made its European debut but so too did the BRZ coupé which mean the Impreza did not get a look in. The G70 concept is the Suzuki Regina concept as shown in Tokyo just with a different name. Suzuki says the funky lightweight car is its vision of urban commuting and offers fuel economy of 75mpg with just 70g/km CO2. Please build it soon! Much more likely to see production in the short term is the Swift Range Extender (RE). Powered by an electric motor with a 660cc petrol engine as back up, the RE is the latest development in technology originally showcased at the 2010 Geneva show. The German mentalists got their hands on the 991-generation Porsche 911 and the company is now offering a complete styling package for the new car. The Geneva show model featured a new front splitter, side skirts and a completely restyled rear end comprising a new bumper, diffuser and spoiler. A sports exhaust has been fitted, as too have larger, 21-inch lightweight alloy wheels. The interior has been colour coded with yellow stitching on the leather and Alcantara seats. The Toyota GT 86 - the Subaru BRZ with a different badge - took its first European bow in Geneva. Alongside the GT 86 Toyota unveiled the new Yaris Hybrid, which uses a 1.5-litre unit that is 20 per cent lighter and more efficient. Official figures include an incredible 79g/km and 80.7mpg. The questionably styled FT-Bh concept also starred. Apparently it is Toyota's vision of the future city car that uses hybrid powertrain and shies away from exotic materials - in a bid to keep the price and weight down. The big news for Vauxhall was meant to be the unveiling of the 280hp Astra VXR and Insignia BiTurbo, but the world debuts were overshadowed by the pre-show announcement that the Ampera range extended EV had scooped the European Car of the Year award. Cue some hastily arranged stickers and an unplanned wheeling out onto the Geneva stand. The Mokka SUV - Vauxhall's entry into the compact crossover segment - just about held its own while some hacks also seemed to be taken by the Rad e concept e-bike. We attribute that to the long days. The Cross Coupé still has not been confirmed for production but on stats alone we have to wonder why. The Evoque rival packs a TDI diesel engine and a couple of electric motors to deliver economy of 157mpg. It is no eco-slouch though as combined the powerplants output 306hp. Why are we still waiting VW? What we are not waiting on is the Polo Blue GT - a car that combines VW's BlueMotion technologies with a 140hp 1.4-litre TSI engine. It is expected to hit showrooms by year end. The rest of the stand was overrun with design studies based on the Volkswagen up!. The surprise of the V40 was somewhat ruined by images leaked on to the internet, but the five-door premium hatchback is an impressive looking machine nonetheless. The sleek look is obviously inspired by cars from Volvo's past like the P1800ES but in a thoroughly modern way. Being a Volvo expect it to be safe but also expect to see a 254hp T5 variant that can sprint from 0-62mph in a shade over six and a half seconds.